The Painted Anemone Urticina grebelnyi sets itself apart from its relatives with its paint brush coloring, but also by its column characteristics and larger size. Reaching just shy of 9" (20 cm) in height, and with their oral disc extending almost 10” (25 cm) in diameter, these are not for nano tanks, but can provide a beautiful focal point in a larger cold water aquarium. A few species of the Urticina anemones have very festive colors, and at first glance they look very similar to one another. But on the Painted Anemone, the color is distinctive. It looks like someone took a paint brush and made sloppy splotches on the pedal column in green and red, thus the name. Similar looking relatives include the Christmas Anemone Urticina crassicornis and the Dahlia Anemone Urticina felina. In fact, the Painted Anemone was previously classified as the Christmas Anemone, so some references still list it as U. crassicornis. However, it was reclassified to U. grebelnyi in 2006. Other unique characteristics of the Painted Anemone include its larger size and a column with bumpy vesicles. The vesicles are clearly visible and non-adhesive, whereas the column of the Christmas Anemone U. crassicornis is completely smooth and the column of the Dahlia Anemone U. felina has strongly adhesive verrucae. Common names are often used interchangeably for these fancy anemones including Mottled Anemone, Painted Urticina, Northern Red Anemone, Painted Tealia, Red and Green Anemone, Northern Red Anemone, Dahlia anemone, and Thick-petaled rose anemone. But. there is basically one generally accepted common name for each species and each one has its own unique characteristics to identify it by. The Painted Anemone can provide a beautiful addition to a large cold water tank. When caring for them, using similar husbandry for other cold water anemones is suggested. They are found in cold waters that are 55 to 68°F (15 to 20°C), so it's a good idea to Invest in a chiller before you obtain one of these guys. They are best kept by intermediate to advanced aquarists who understand cold water marine tanks. Keeping them in a species specific tank is a wise idea since they will multiply and sting other corals and may eat small fish and inverts. Like all anemones, they use their venomous cells, or nematocyst, found in their tentacles to sting and deflect any possible threats or attacks. But they mostly utilize them for stunning and capturing prey. Some predators of the Painted Anemone can be certain nudibranchs, sea stars, and snails. The Painted or Red and Green Anemone was at first categorized as Urticina crassicornish, however it was moved to Urticina grebelnyi in 2006. Why? Because the Painted (should be called Green and Red Anemone since many in this genus share the same common name) Anemone's pedal column is, yes you guessed it, red and green! This is the most distinguishing difference. They are found in tide pools in cold waters so a chiller, a mature tank and clean water is a must. The Painted Anemone was described by Sanamyan and Sanamyan in 2006 as Urticina grebelnyi. It had been previously described as the Christmas Anemone Urticina crassicornis by Müller in 1776, but this is now recognized as a separate species. The Urticina genus is a member of the Actiniidae family and contains approximately 6 species. The U. grebelnyi are found in cold waters of the north western Pacific Ocean. This anemone is not on the IUCN Red List for endangered species. Some other common names it is known by are Christmas Anemone, Mottled Anemone, and Green and Red Anemone. They use their venomous cells, or nematocyst, found in their tentacles to sting and deflect any possible threats or attacks. But they mostly utilize them for stunning and capturing prey. Many species will retract their tentacles and close up if the water is sparse during low tides.They eat sea urchins, small fish, crabs, and mussels. Painted Anemones can grow to almost 6" (15 cm) in diameter topped with a wider oral disc just shy of 10" (25 cm) and stand from 8.7”- 19.5 (20 - 50 cm) in height. It is unknown how long anemones live, in fact, some anemones can be hundreds of years old in the wild and in captivity some have been known to last 80 years or more. It is believed Urticina anemones can live between 60 to 80 years in the wild. Painted Anemones are commonly confused with the Christmas anemones U. crassicornis, but each has distinct characteristics. The Painted Anemone has clearly visible, non-adhesive vesicles on the pedal column, while the column of the Christmas Anemone is completely smooth. The Painted Anemone's pedal column has patches of green, or red and yellow. The patches vary in size, with some being more green or more red depending on the individual anemone. Thus the common name Green and Red Anemone. There is a foot at the bottom of the pedal column that the anemone uses to adhere to various surfaces. They also use this "foot" to move around if conditions are not ideal. They can also move by inflating themselves, detaching from the surface, and then rolling along with any current. They will move to avoid predators like starfish, but in the aquarium they move primarily if they are unhappy with the water conditions or the food. At the top of the column is an oral disc with an opening, or mouth, in the center. The U. grebelnyi takes food in and expels waste through this opening. The oral disc is usually plain brown, pale yellowish green or pale lilac with an open area around the mouth. The mouth should be closed and tight. It will open when hungry, having an oval look. A gaping mouth is a warning signal that the anemone is not doing too well. Depending on its size, there can be up to 200 tentacles on this anemone. They are arranged on the margin or outside edge of the oral disc. The outer tentacles reach 1.5” to 2” (4 - 5 cm) long. The ones in the center are shorter and only 0.38” (1 cm) long. The tentacles are the same color as the oral disc, yet in the middle of each tentacle is a red, brown or lilac band. Size of organism - inches: 6.0 inches (15.24 cm) - Their column can grow to almost 6" (15 cm) in diameter topped with a wider oral disc just shy of 10" (25 cm). They are typically about 8.7” (20 cm) tall, though an occasional specimen can reach over 19.5 (50 cm) in height. Lifespan: 80 years - Urticina anemones can live between 60 to 80 years in the wild. The Painted Anemone can be moderate to difficult to care for because they do have specific lighting needs and must be in cold water. These are best kept by intermediate to advanced aquarists who understand cold water marine tanks. As with most anemones, the tank should be at least 1 year old and stable before adding your new anemone. These cold water anemones need more specific care than tropical anemones and need perfect treatment from the start. They are found in waters that are 55 to 68°F (15 to 20°C), so a chiller is necessary. Keeping them in a species specific tank is a wise idea since they will multiply and sting other corals and may eat small fish and inverts. When selecting a U. grebelnyi, make sure the color is good, their mouth is not gaping open, and their foot and tentacles are sticky to the touch. Also, they should be attached to something and make sure there is no damage to the foot area, often a result of pulling the anemone off its surface. To take a Painted Anemone from another aquarium, use a thin blunt item like a credit card. Gently wiggle it under the foot and slowly nudge the anemone away from the glass. If it's attached to a rock, ideally you can purchase the rock as well because these guys can stick hard and may be damaged if removed.. If you cannot purchase the rock, then directing water at it or wiggling the rock gently upside down under water while tickling the foot can work. Aquarist Experience Level: Intermediate - Intermediate to advanced. The Painted Anemone is a carnivore. In nature, they use their potent sting to immobilize small fish and invertebrates, primarily sea urchins, crabs, and mussels. In captivity feed your anemone chopped silversides, shrimp, krill, and mussels, fresh chopped fish (from your grocery store), as well as frozen carnivore preparations. The metabolism of U. grebelnyi is not as fast as warmer water anemones. They are cooler water creatures, so usually only need to be fed once a week or twice a month. Live foods (fishes, shrimps, worms): Some of Diet - From marine sources. Liquid Foods: Some of Diet - Zooplankton. Meaty Food: All of Diet - Sources of marine flesh and frozen/thawed preparations for carnivores. Feeding Frequency: Weekly - Feed only once a week or twice a month, because cold water anemones have much slower metabolisms. Water changes of 10% bi-monthly or 20% a month are typical. Monitor your water quality for your particular situation and adjust your water changes accordingly. Waste production created by your anemone can be calculated in inches. Basically, every inch of anemone is equal to an inch of fish, so an average-sized Painted Anemone produces a bio-load equivalent to that of about two 3" fish. Purigen and Poly-fiber are great products to help in maintaining water quality. Purigen is a synthetic polymer that removes soluble and insoluble impurities from water at an exceptionally high rate and capacity, helping to control ammonia, nitrites and nitrates. Additional chemical additives, such Chemi-Pure, GFO, and carbon also help maintain quality water parameters. Poly-fiber can be cut and used in sumps, etc. A good protein skimmer is a must. Although anemones are not as dependent on calcium as stony corals, magnesium and calcium is still needed to keep the pH and alkalinity stable and within the correct parameters. Additions of trace elements are suggested. Phosphates should be kept around 0.03 or less. Control phosphates with products such as Phosban and the Phosban reactor. Phosphates should be less than 0.03 ppm. Water Changes: Bi-weekly - Water changes of 10% twice a month, or 20% a month are typical. 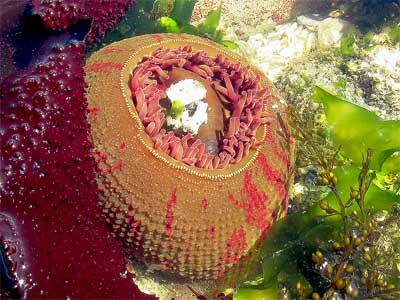 The Painted Anemone gets pretty large, needing an aquarium of 50-gallons or more to thrive. The typical reef environment is needed, but it must be a cold water reef. It is a good idea to Invest in a chiller before you obtain one of these guys. They need live rock or some other solid material they can attach to. Provide some rock crevices as well as rocky overhangs. Bacterial formations take a very long time in cooler water, so the most important thing for the reef is mechanical and chemical filtration. Provide a good skimmer and use filter floss and chemical additives, such Chemi-Pure, GFO, and carbon in the filter to help keep the water clean. Chemi-Pure helps remove heavy metals, copper, phenol, ammonia and other nitrogenous waste. It also helps keep the pH at a consistently safe range. Granular ferric oxide, or GFO, helps with phosphate control. The addition of a refugium with a deep sand bed can help maintain normal parameters, too. They need a moderate to high-surge water movement and average lighting. The light emitted from LED and t5 fixtures puts off less heat, which is essential with a cold water tank. The temperature can be between 55 to 68° F (12.7 - 20° C), but whatever temperature you choose, keep it stable as fluctuations can be stressful to the anemone. A chiller will be needed, but this allows you to have both inter-tidal and sub-tidal animals. Acrylic tanks are best for insulating against temperature fluctuations, each 1/2" will give a thermal barrier of 5° F. Be sure to have all of your pumps covered, most good quality pumps have guards on them. Lighting Needs: High - Strong lighting - Moderate to high. Coming from shallow waters in the wild, these anemones will do their best with stronger lighting. Water Movement: Moderate - Moderate to strong. The Painted Anemones are considered semi-aggressive because they can be mobile and may split often once settled, similar to others in their genus. It has often been suggested to not put anemones in a reef environment since corals cannot move away from the stinging tentacles. Most of the cold water anemones will stay still if their needs are met. They will move, however, if your lighting is not good or the water quality is not to their liking. Painted Anemones are best kept in a species specific display. Keeping corals in the tank can be a risky thing to do because they will sting everything they can reach, like corals and other invertebrates. Anemones will move if your lighting is not good, or the water quality is not to their liking. If attempting to add cold water corals, allow the anemones to settle first. Once they are in place, you can then try placing a coral away from them. If the tank is very large, keeping larger cold water fish should be fine. Problems occur when keeping small gobies, blennies or other small cold water fish. These can easily become dinner if they wander into the very sticky (more sticky than typical) tentacles of this anemone. They do not host clownfish. Be cautious with other tankmates, too, as this beautiful anemone does eat many invertebrates that wander their way. Urticina anemones will eat crabs, mussels, barnacles, sea urchins, and even jellyfish. Some predators, can be certain nudibranchs, sea stars and snails. The Painted Anemone should divide in captivity. There is no information on the propagation of cold water anemones, however, but it may be just like other anemones. Similar to other cold water anemones, they reproduce by fission or external fertilization of egg and sperm. When they spawn, they produce larvae that will float away, and eventually finding a spot to land. They then attach and develop a pedal disk that grows into a new anemone. Problems for the Painted Anemone are pretty minimal unless your lighting, water movement, feeding and water quality are low. Then your anemone will detach to look for “better conditions.” In general, if your anemone moves, it is not happy. Make sure your lighting and water quality is good, and that the food you are offering is to their liking. Some predators include certain nudibranchs, sea stars, and snails. The Painted Anemone is generally unavailable to aquarists through retailers.